after a lot of waffling back and forth on the PS1 bag, i've decided to take it off my list. instead, i ended up getting several budget-friendly essentials: the chambray shirt and classic denim jacket have taken me through much of September, and now that it's officially chilly i'm living in my marant-ish sneaker wedges and acne oversized wool scarf. 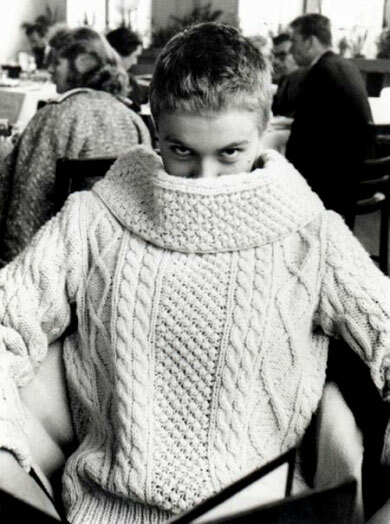 still on the list is a chunky cable-knit cashmere sweater. i found this lovely one on sale, and it's the quintessential Didion-esque piece of the season for me. also wishlisting a pair of dieppa restrepo oxfords in a classic color like burgundy or camel, or these gentlewomanly loafers by Church's that are such a nice, grown-up work shoe. the last item, a simple blue oxford shirt with a contrasting club collar, is something i'm getting made by a bespoke shirtmaker. it should be ready in a few weeks, so i'll do another post on that soon! what's on your fall wishlist? have you checked off any items yet? Love your wish list - especially those oxfords. What a gorgeous colour! I have had a burgundy leather bag on my wish list for a while now, and I think I might save up to buy one later in the season. Something in a lightweight leather, in a classic shape, with a shoulder strap, and without too many bells and whistles. I am also going to get a dress made by a local designer, White Champa. In a hand-woven ikat silk. It's not strictly a fall/winter purchase, but it's a piece I will wear forever. i know, every fall i find myself in the mood for a lovely burgundy accessory. your custom dress sounds amazing - i am always in search of interesting silk textiles, and woven ikat is one of my favorites! Ouu I can't wait to see the custom shirt. -ps. do i dare ask about the rhymes with "banolo mlahnik" shoes? oh god, there was a clerical snafoo with the DCA last month which meant further delay in getting that filed and under way. to be honest that whole experience was so upsetting that after the BBB failed to get any compensation, i spent most of Sept avoiding thinking about it. Love the very idea of burgundy oxfords. Such a nice twist on a classic. I chanced upon my jacket from The Row (a navy jacket has been on my list for some time). I restocked my collection of Wolford Merino tights in black, mocha and charcoal grey- it's not cold enough to wear them yet, but they are the only tights that keep me warm come winter. There's not much on my wishlist, but I would love to add something burgundy to my wardrobe. Other than that it's benefit season, so I'm looking forward to collaborating with one of my favorite designers who is working on dresses for the entire committee. your project sounds divine! as does your Row jacket...a Row item is perpetually on my dream wishlist! I've been hunting down Burgundy brogues left right and centre and every time I try on a pair, they fail me. They fail in that they make me look small and squat. So based on that fact, I have given up. But the ones you have picked are divine. Please don't start me off on another search! i think styled the right way, darker flat shoes that cover most of your foot can definitely look sleek and flattering. It always feels like some sort of relief when you can cross a pricey item off your wish list. Sounds like you have made some good purchases so far thoug, and I'm really looking forward t seeing your custom made shirt. I bet it's divine! i have such a love-love relationship with dieppa restrepo. once i even ordered a custom pair and it took a MILLION years and i found it in my heart to forgive them because they were PERFECT!!! on the wish list--wendy nichol canteen bag in olive at anaise. wendy nichol literally takes my breath away every season. i have a couple of her bags and the craftswomanship is just incredible. ha! i'm a WN fan too - first discovered her stuff back when she was primarily designing punky silver earrings. One of my two big purchases this fall, in addition to boots, was a barbour jacket. After reading this site, I've was inspired to get one, especially since I've been forever searching for the perfect utility jacket, and I love the whole waxed cotton thing. I finally purchased the Barbour Bedale in black in a size 32, but am on the fence about whether to keep it. I have a pretty curvy figure, and while I do have at least one oversized men's jacket that I love and wear to death, the Bedale feels like it works against my proportions somehow. The main issue is that it's kind of snug around the hips, which I don't love. I tried on the 34 but it was just too big. Do you have this issue with the Bedale? And do you recommend any alternatives in the Barbour line from the women's jackets? I was thinking of maybe trying the Beadnell, or the Vintage Beadnell, which looks kind of cool. hmm in my posts on the my barbour you can tell that it hits me right at the high hip, and there are snap vents at the back that you could leave open if you find that it's slightly tight around your hips. i haven't tried any of the women's versions, as to be honest i think the original Bedale is still the best one! i don't mind a bit of roominess as it just means more room to layer underneath. hope that helps? On the subject of Barbour jackets, I am compelled to weigh in as I own more than my (or any reasonable person's) fair share. The Bedale takes the right kind of body on a woman, I think. In fact, all the Barbour men's jackets require a straight, slim built. I have the Border, which is a long version of the Bedale. I use it on really ugly weather days, but I can make it be cute as well - leggings, low boots. For looking sharp I like the Barbour Utility jacket. I do not like the Beadnell. The sleeves are too short and it's trying too hard, and failing, to be the Bedale for women. If the Bedale doesn't work for you, try the women's Utility jacket, or even the winter parks, which is not wintry at all. Thanks so much for the feedback on the Barbour! I'm going to keep my new Bedale until I try out the Utility jacket and then decide which one is better. For the utility - Full House, what's the sizing like? I normally wear a XS--S or a 2--4 in most standard American brands for jackets. The Barbour sizing is confusing to me. The smallest size Orvis carries is a 4. I assume this is like a women's US 4? If you have any insights on sizing, do let me know. Such a pricey item :) I want to get it right the first time if possible. Thanks! My utility jacket is in a size 6, which is a British 10. I normally wear a size 4 in American clothes, small or extra small depending on the cut, size 27 jeans. Hope that helps. Let me know! Also meant to add: I bought the madewell chambray boyfriend shirt, and after just two washes it started fraying badly at the collar so i returned. i'm going to try the western jean shirt instead - seems like sturdier material. how's yours holding up? now i need a black belt, a new scarf, some black flats that don't give me blisters, and maybe a pair of black oxfords/loafers or ankle boots. can't wait for the custom shirt! i really want a good pair of work loafers, but i can't decide if the church's are really worth the price. i have a love-hate relationship with shoes, but it might be worth ordering a pair from gravity pope to try on. my list includes lenses for my new eyeglasses, a versatile v-neck cardigan, and an interview-appropriate skirt. pretty boring, but right now i need to focus on practical work clothes. i hear ya. dieppas and church's are pretty much the two main brands i love right now for gentlewomanly shoes. also if you're looking for cardigans, the Outnet has some fantastic cashmere ones on major sale right now! After last month's mini shopping binge in Oslo it is time for that inevitable month-or-so where I rock back and forth in the fetal position, swearing on my life to never ever buy anything that I don't really need again, ever. Thankfully it is my birthday next week - what better occasion to make a fresh start? That cashmere sweater looks gorgeous. I bought a teal one last winter and I can't wait to start wearing it again! good call on ditching synthetic winter scarves! there's nothing better than a soft natural-fiber scarf for cold days. Composing my Fall shopping list makes me a little more giddy than I'd like to admit (even if I don't end up purchasing everything). I've been on the hunt for the perfect pair of brogues for, oh, about 2 years. Maybe I'm being too picky, but I have yet to find one that doesn't make me look as though: A) I'm going bowling or B) I'm borrowing them from my father. And of course at the right price-point, too. I'm absolutely ready to pick up a chambray shirt this week, but I'm torn between the Madewell version and J.Crew's Keeper Chambray-- you look fab in the Madewell one, so now I'm even more indecisive! I hope this isn't a bother, but I was hoping you could tell me if your white Equipment blouse is either the 'Bright White' or the 'Nature White'. Thank you! Weighing in. I bought the Madewell. It had a "distressed" spot on the front where you could push through the threads. I returned it for another one, but first spoke with customer service, told them what happened, and asked them to look carefully at the next one. The next one also had a patch in the exact same spot. It would have been a hold within weeks. I ended up buying the J Crew Keeper. I was reluctant because I like to think I have "outgrown" J Crew but I've got to say - it's much better on me than the Madewell was. The Madewell was boxy. Miss Sophie - I don't think I am as slender as you are. Maybe that is why the Keeper looked better. Full House, I'm sorry the quality of the Madewell shirts weren't up to par, but glad the Keeper Chambray ultimately worked out for you, though. I'm really drawn to the Keeper's shade of blue, it's just lovely. Thank you for your input, I really appreciate it. This is my favorite style blog, not only for the content, but because Miss Sophie seems to truly care about her community of readers. Thank you again! that's really sweet, thank you! :D let us know which one(s) you end up keeping!